Is this JAL First Class Amenity Kit as Awesome as the Seat? The JAL First Class amenity kit comes in 2 versions depending on whether you’re on a long-haul flight to or from Japan. Today Jake unBOXes the inbound version. 4 layers deep (inside plastic wrapping, inside a plastic container, inside a bag within a bag) are a pair of 3M earplugs. 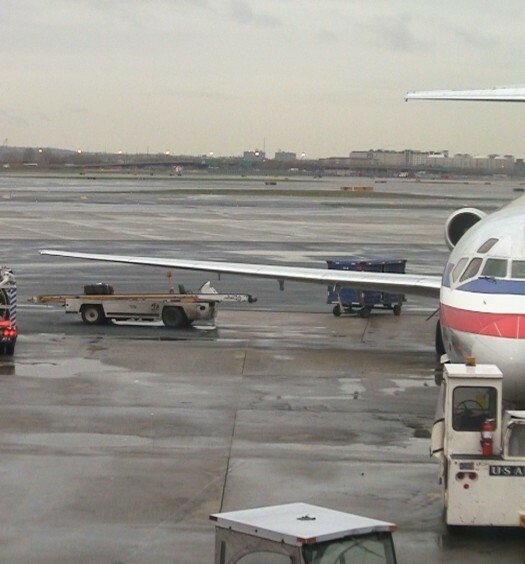 These are as good as we’ve used from a kit on a plane but you might do better with a higher decibel-rated earplug from the likes of Macks, Heros, Moldex and others typically available at your local drug store. Shiny on the outside and soft on the eyes, the JAL First Class amenity kit eyemask is one that we like a lot. It’s an easy velcro strap around the head for near-complete darkness and hopefully hours of restful sleep in your Japan Airlines First Class Suite. The dental kit isn’t remarkable but serves it’s purpose well. Equipped with a travel toothbrush, travel (but not tiny) sized toothpaste and a small bottle of mouthwash, you’ll arrive in Tokyo without seaweed stuck in your teeth. If it hadn’t come with a full-sized bottle of high-end Shisedo mens lotion, we’d complain that there aren’t as many skin care items as we had hoped for. 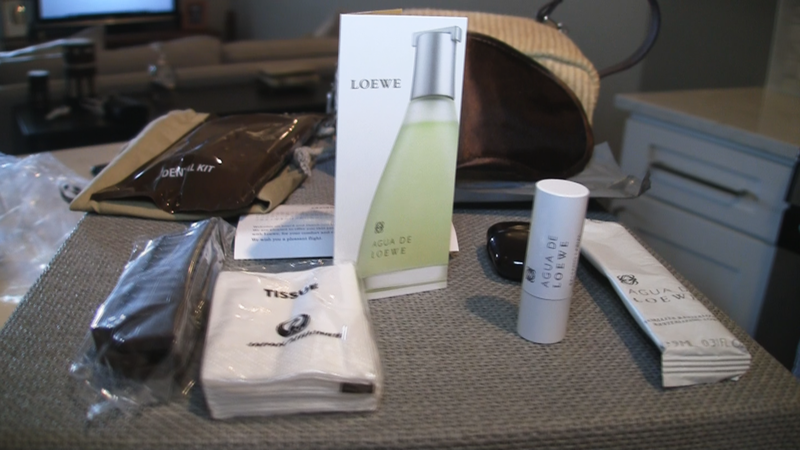 Inside this JAL First Class amenity kit , the only Loewe-brand items are a lipstick-shaped lip balm and a refreshing towelette. 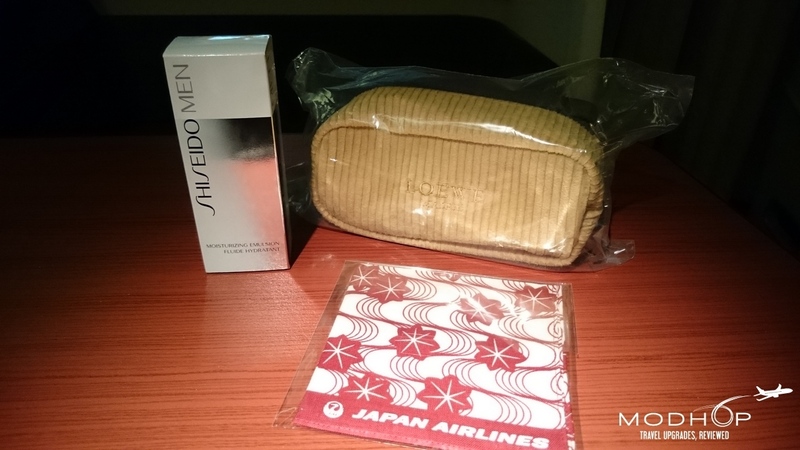 Our JAL First Class amenity kit came with a full bottle of Shisedo men’s moisturizer and a commemorative handkerchief. Other items include a moisture mask, tissue and a switchblade style comb/hairbrush combo. All this comes in addition to JAL-provided pajamas (see them in our full gallery of pics) and slippers for comfort during your inbound long-haul flight. 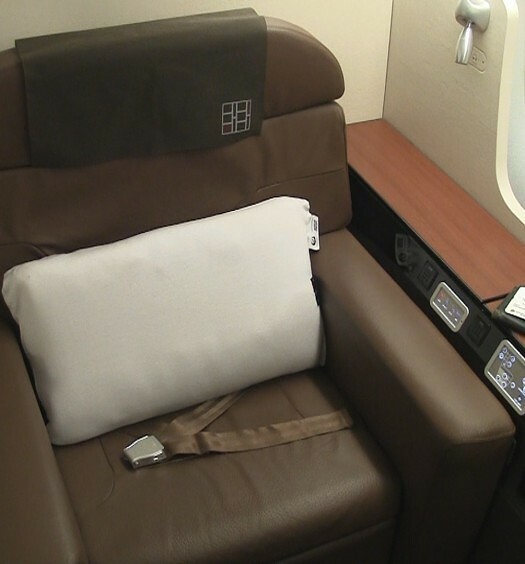 Here’s our video for JAL First Class, or watch with the full review. 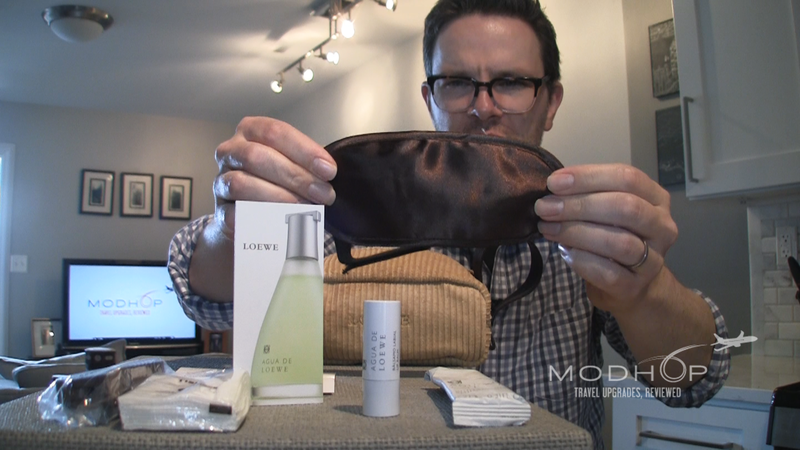 Thanks for watching our JAL First Class amenity kit unBOX. See our other kit unBOXings now and watch for more soon.